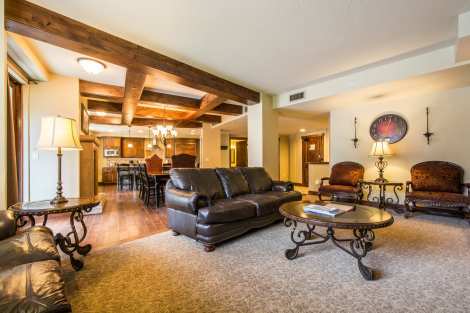 Located at Canyons Ski Resort, this fantastic condo offers guests loads of space to bring the whole family, or host a fun ski town get-away! Featuring ski-in / walk-out access, guests will love the ease of access this well-appointed condo offers. Each bedroom shares a main foyer area, but separate key-card entrances ensuring absolute privacy. Located on the second floor of the Unita building, guests will relish the 360 panoramic views of Canyons ski resort and the surrounding mountain ranges. Two private patios allow guests to kick back at the end of a day exploring Park City and enjoy the views! The property offers comfortable snow lodge décor with expanse cathedral-style ceilings. Built with the finest details in mind, you’ll relish in the gourmet kitchen appointed with granite countertops and knotty wood cabinetry. The bedrooms offer luxe bedding – perfect to snuggle in to as you dream about days well spent exploring Park City! Overall great experience. Thank you! I would only add I tried to call twice to report a few minor (very minor) items that needed attention in our room but got voicemail. When I tried to leave a message I was cut off (like the voicemail was getting full). Again, just a minor thing. but FYI. Our family of 4 and both sets of Grandparents rented this unit for a 4 day stay in Park City. We could not have been happier. The main living area was perfect for our family and the unit is set up where each bedroom can close an extra door for privacy. (Each unit can also be accessed individually from the interior hall but, we chose to use the main door as our entrance). The unit was clean and provided everything we needed for our stay. We did grocery shop and purchased extra paper towel and detergent for the washer and dryer to replace what we had used. Housekeeping was something that we needed to add if we wanted but we did not have any trouble washing our towels on our own. The dishwasher was loose but after telling management, they thanked us for letting them know and said they would make sure it was repaired. Although some of the bed comforters and shams appeared to have some stains, the sheets were clean and the beds were comfortable. We chose not to use the comforters and shams for our stay. The resort is absolutely beautiful. We enjoyed the pool and hot tubs nightly. They were a very short walk from our room. The gym and other spa amenities were also very nice. The front desk was always willing to assist with our questions and there was a computer in the lobby to use for boarding pass printing at no additional cost. This unit is in the Canyons resort area and is a 10 minute drive to historic Park City where most restaurants are located for afternoon and evening meals. If ever visiting Park City again we would definitely want to return to this unit. It was beautiful.